Pressing “Alt + Ctrl + Del” in windows is a life saver when some programs just refuse to respond. Of course it opens a task manager which will show you the list of all the processes along with their memory , cpu consumption. You can select any process and can end it. However, there is no such inbuilt task manager provided in Gnome ( I am not sure about others). But that does not mean, Linux is behind the league anywhere. There is a very small inbuilt utility which helps you close any misbehaving application. 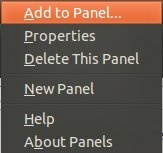 You can add this utility in any of the panel. Right click anywhere on the panel and click Add to Panel. 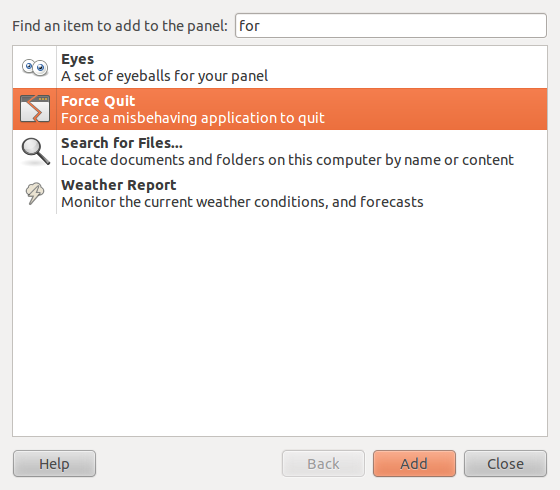 Now in the window, type force to filter out the “Force quit” application. Now click “Add“. It will now appear on the panel you tend to add. Next time any application starts behaving stupid, just click on the “Force Quit” icon and next is click on the application which you want to close. That’s it the application will be closed immediately. It is not a full fledged application like Windows task manager but it performs the most important task of killing applications that no longer respond to the user.